CHARLO — With 40 years of coaching under his belt, Gale Decker is a veteran when it comes to knowing basketball. This being his second season as the Charlo Vikings head coach, he is enjoying his team along with the camaraderie from the community. The Saturday, Jan. 9, game against Darby showed just that. The gym was packed full with Viking fans on both sides of the court. With the encouragement from the sidelines, the team has gone on to have a 7-1 record for the season. One key component to this early season success is the expectations in practice and in games, according to Decker. “This is my second year coaching this team so they understand the intensity it takes in practice and in games to continue to see improvements,” he said, adding that his four returning seniors have helped communicate the expectations to the younger classmen. “The senior class is the core of the outfit,” Decker said. Decker coached all four of his seniors last year and has been working on each players’ strengths early in the season. Along with their work ethic, “the height and size of our seniors has helped,” Decker said. At 6-foot, 5-inches tall, senior Greg Montgomery “is our tallest player and is a good scorer,” Decker said. Jade Smith, the second tallest at 6-foot, 1-inch, “is one of our better perimeter shooters,” he added. 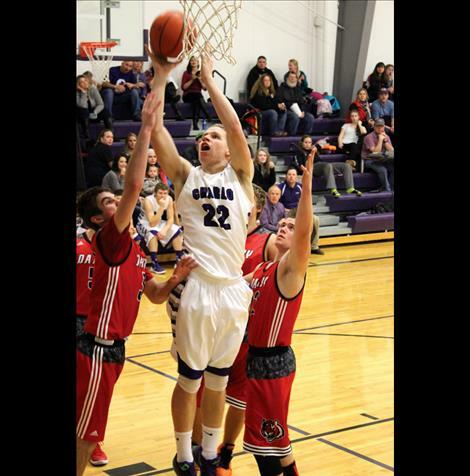 6-foot-tall Dugan Runkel “is great at rebounding and can jump,” he said. Topping off the list of seniors is Michael Delaney at 6-foot tall. “Delaney gets the team into its offense and is a good ball handler ... also very quick on the floor,” Decker said. Although the team has a solid group of seniors, the Vikings need to work on their team defense, according to Decker. The Vikings’ effort on defense paid off during Saturday’s game against Darby. They kept Darby to only 39 points, beating the Tigers by 18 points in the 57-39 non-conference win. Other supporting players are sophomore Tyson Petticrew, who was the high scorer in Saturday’s game against Darby with 16 points and Freshman Landers Smith, who contributed 8 points. Adding to the goals for the season is point guard Michael Delaney. “Last year we finished third, and our goal is to beat that and make it to the finals,” Delaney said. Along with their win against Darby, the Vikings beat Missoula Hellgate’s sub-varsity Friday, Jan. 8. With hopes of making it to the end of the season, the team has to get through next week with a competitive lineup. The Viking host Arlee on Thursday, Jan. 14 for a 7 p.m. game. Following Thursday’s game is another home game against Hot Springs on Friday, Jan. 15. Charlo – Points: Tyson Petticrew 24, Michael Delaney 12, Landers Smith 4, Jade Smith 4, Dugan Runkel 4, Garett Vaughan 4, Greg Montgomery, Kane Sheyner 1. 3-pointers: Petticrew 3, Delaney 1. Assists: Delaney 5, Sheyner 2, L. Smith 2, Zane Hafliger 2, Petticrew 1, Vaughan 1, J. Smith 1. Charlo – Points: Petticrew 16, J. Smith 12, L. Smith 8, Runkel 6, Montgomery 6, Sheyner 4, Vaughan 3, Delaney 2. 3-pointers: Petticrew 4. Assists: Delaney 5, Sheyner 2, L. Smith 2, Petticrew 1, Montgomery 1, J. Smith 1. Rebounds: Runkel 7.